This one’s actually a free-for-all recipe, and perfect for people who like to harbor leftovers in their refrigerator. You can toss in whatever veggies or leftover meat you have in the fridge. But don’t just throw in all of them. 1. Preheat oven to 375 degrees Fahrenheit (190 degrees Celsius). 2. In a medium pan, sauté onion. When translucent, put in the baby spinach or arugula and cook until wilted. Season with salt and pepper. Set aside. 3. Butter/oil the ramekins. Line the ramekins carefully with the prosciutto. Divide the onion-spinach/arugula mixture between the 2 ramekins, then the tomatoes. 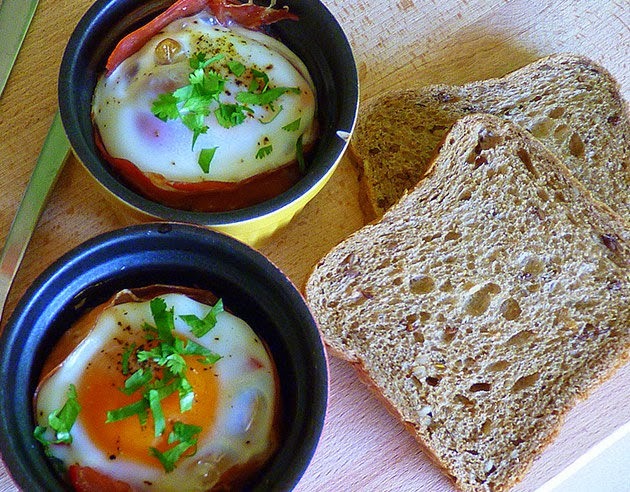 Carefully crack an egg into each ramekin. Season with salt and pepper. 4. Place in the oven and bake for 12-17 minutes, depending on how runny you want your eggs.